Thanks to all visitor for the interesting conversations and discussions. We are proud to see this outstanding facade project in the Swiss magazine Architektur+Technik. Dr. Roye talks about new developments and trends of translucent concrete at the conference "Sichtbeton" in Hannover, Leipzig and Berlin. 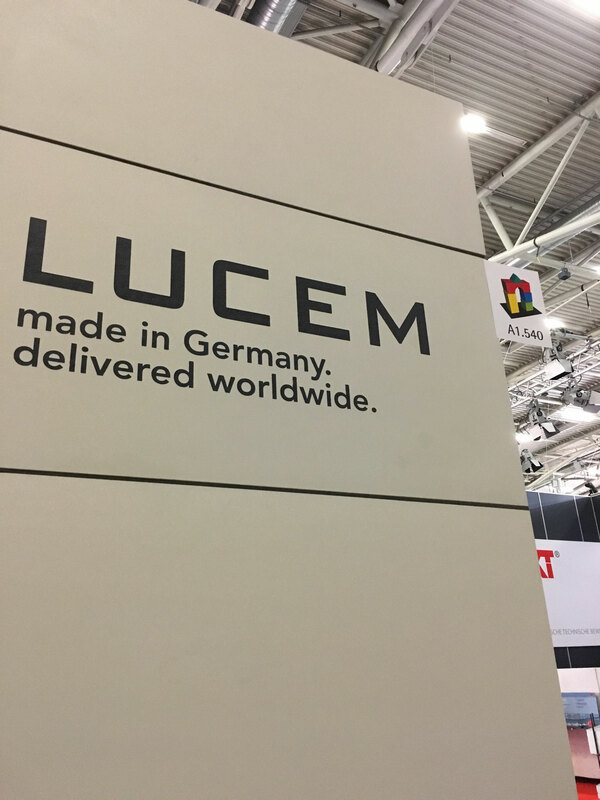 LUCEM says thank you to all the visitors and the many interesting conversations. Link to an interactive 360° view of the LUCEM booth. The exhibition shows the unknown side of the textile industry, away from fashion and interior decoration. These little-known textiles with their often surprising properties play an important role in almost every aspect of our lives: the possibilities of use of the New Stuff range from medicine, the construction sector and the construction of vehicles to the extraction and saving of energy. At first glance, many of them are often not recognizable as fiber-based materials or textile structures. They are the product of complex technical research and elaborate manufacturing processes, which have nothing to do with the conventional concept of textile production. With this year's Forum, the InformationsZentrum Beton, with the participation of the Informationsgemeinschaft Betonwerkstein eV, would like to present the latest state of development in the extensive range of demanding visual concrete. The concretes of the future impress with their unique appearance, whether as a wall or floor surface. Modern terrazzo floors also offer numerous possibilities for the application of cement-bound construction. Even translucent concretes are now possible on a large scale and offer new perspectives for special technical requirements and a unique spectacular architecture. In the forum many project examples are presented. It also shows how concrete architectural and architectural requirements can be met by using concrete technology. The event is aimed especially at architects, planners, builders and builders. Good progress in Amman, finishing soon. 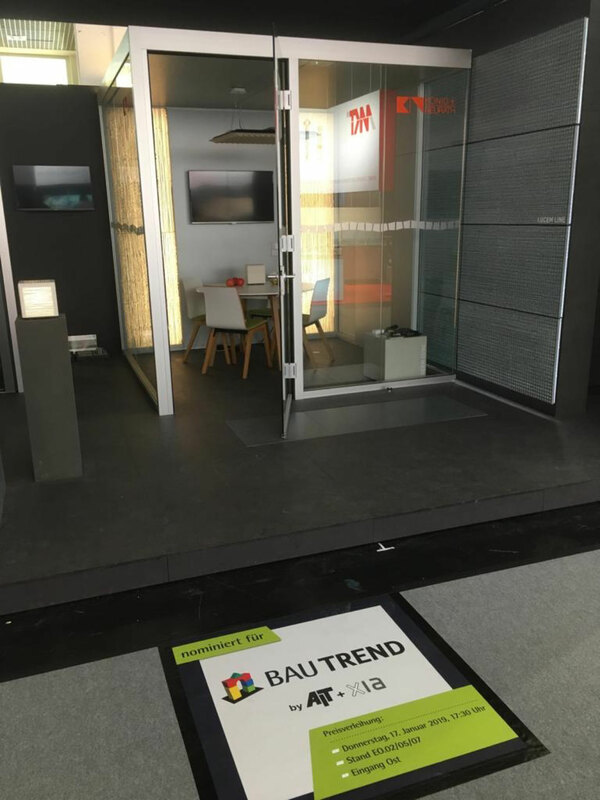 Wir bedanken uns bei allen die uns auf der BAU 2017 besucht haben. LUCEM produced the trophy of the Fiabci Prix d'Excellence 2016 designed by artist Thomas Eller. The award ceremony took place in Ritz Carlton, Berlin on the 04th of November. The local TV sender WDR presented a short film about the Al Aziz mosque project in Abu Dhabi. Our CEO, Dr. Roye, has been live in studio to give answers to the questions. We would like to say thank you to the WDR studios for this nice report. LUCEM produced the trophy of the Fiabci Prix d'excellence 2015 designed by artist Thomas Eller. The award ceremony took place in Ritz Carlton, Berlin on the 18th of September. In Izmir, Turkey a 40m high and 3.6m wide LUCEM light transmitting concrete fascade has been finished. 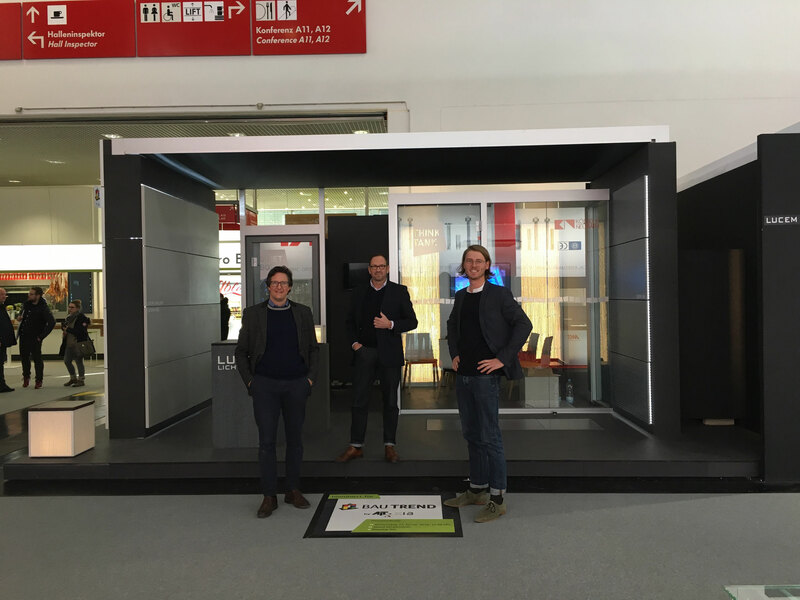 LUCEM was at the BAU 2015 in Munich from 19th to 24th of January. We would like to thank our visitors for their lively interest. From the 7th of June until the 23rd of November LUCEM wil be represented at 'La Biennale di Venezia'. In the wall room of the architectural fundamentals LUCEM will provide a 6m x 3m exhibition wall. First installation finished in Spain. LUCEM Lichtbeton has been at the UK Concrete Show from February 27 to 28 in Birmingham together with our partner Telling Architectural. We demonstrated a façade section as well as a variety of reference projects. We would like to thank our visitors for the vivid interest in our product and Telling Architectural for the great support! The entire LUCEM Team always focuses on sustainable projects with Light Transmitting Concrete - ressources- and energy-saving minded. We are very proud now, that this mindset - on the example of the worlds first facade with LUCEM light transmitting concrete - has been nominated by an online-voting and a jury for the GreenTec Awards 2013. Thanks to all, who have voted for us. We understand this nomination as an incentive to go ahead with our environmenally friendly approach in the international building business. International day of intellectual property. LUCEM contributed to a discussion in Berlin on April 26th 2013. LUCEM Lichtbeton has been at the Surface Design Show 2013 from February 5 to 7 in London together with our partner Telling Architectural. We demonstrated our display - a façade section - with an colorchanging LED light system - suitable for media facade applications. The great run (235.000 visitors) on the BAU 2013, leading fair for architecture, materials and systems showed once again the international importance of this exhibition. The LUCEM booth attracted a lot of attention and we were able to talk to many visitors. Thanks to all visitors for their interest in LUCEM Light Transmitting Concrete. On Nov. 29th LUCEM translucent concrete was featured on the TV show "Wissen vor acht". The episode was aired on ARD - the 1st German television - just before the evening news. We are proud that our spanish distribution partner will represent LUCEM on the 16th of November at the ArkiForum 2012, Foro de Arquitectura de la República Dominicana this year. The first fassade made of LUCEM translucent concrete will be finished soon, the final panel has just been mounted. The opening ceremony with special lightshow will take place on Thursday, December 6th 2012. On the 14th June 2012 the European Inventor Award was awarded by the European Patent Office in co-operation with the Danish EU Council Presidency, the Danish Patent and Trademark Office as well as the European Commission. The award was traditionally presented in the categories Industry, SMEs, Research, Non-European countries and Lifetime achievement. We are very pleased that this year the awards are made of LUCEM light transmitting concrete. This semester I had the chance to lecture on technical textiles in construction and translucent concrete applications. This was part of lecture course on technical textiles at the Institut für Textiltechnik at RWTH Aachen University. Thanks a lot for the great response! We consider training of young academics a responibility as well as great opportunity for our company. So if you are looking for an internship or a company to do your thesis paper, please conact us! The great run on the fair BAU 2011, leading fair for architecture, materials and systems brought record numbers of visitor. This underlined impressively the status of BAU as a leading fair in the construction industry. During 6 days about 230.000 visitors visited the fair at the Neue Messe Munich. The spectacular design of LUCEM booth attracted a lot of attention and many visitors. In total, 1900 conversations were hold with the intention to continue them after the fair. LUCEM LINE and LUCEM STARLIGHT were installed as wall reliefs up to 6 meters high with thicknesses from 30 mm up to 180 mm. In addition a portion of the floor was made up of large format LUCEM STARLIGHT plates - enduring thousands of feet!